Among our common wild flowers that quickly attract the attention of the observer is the Wild Yellow Lily. Its home is in the swamps, the wet meadows and fields of Canada and the United States, east of the Missouri River. It is also called the Canada, the Field, and the Meadow Lily. 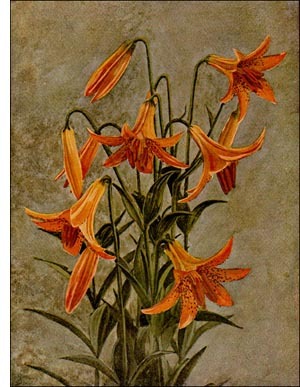 This plant, with about forty-five sister species, all beautiful, belongs to the genus Lilium. All are natives of the Northern Hemisphere and are found distributed around the world. About sixteen species are natives of the United States. The flowers vary in color. Some are red, others white or yellow, and some are more or less mottled. No plants are more frequently mentioned in ancient myths and by the classical poets. The slender stalk of the wild yellow lily arises from a scaly, bulbous, and thickened underground stem, growing to a height of from two to five feet. The leaves are narrow and lance-shaped, from two to six inches in length, and usually attached in whorls of from three to eight. Each stalk bears from one to fifteen flowers, the ground color of which is yellow or reddish with brownish spots toward the base of each division, which are six in number and are spreading and gracefully arched. The flowers, appearing in June, July, and August, are nodding, and vary in length from two to four inches. The fruit pods are oblong, large, and bear numerous seeds. Closely related to the plant of our illustration, and at times closely resembling it, is the beautiful Turk's Cap Lily (Lilium superbum). This species is wonderfully prolific in the production of flowers, sometimes bearing forty or more on a single stalk. It is one of the tallest of the lilies, and frequently the marshes of the Eastern States are transformed by its presence into striking masses of color, orange, orange-yellow, or red.